OTTAWA—If independent and alternative media are important to the success of social movements, then finding ways to fund that media is something that needs to be taken seriously. This is a subject of vital discussion, and there are people in Canada and abroad working on suitable approaches to this problem, both in terms of structural models and also supportive public policy. Christine Crowther, a PhD student in Communication Studies at McGill and part-time Journalism lecturer at Concordia in Montreal, sees a need for broad support networks to get involved in advocating for public policy supporting responsible journalism. Along with a need for public policy support, independent media-makers are also confronting immediate funding challenges to keep their media outlets and projects afloat and sustainable. One inspiring model is led by Tom Stites, Founder and Director of the Banyan Project in the US. The Banyan idea won a Game Changer award from the We Media Conference in 2010, which paved the way for Stites’ fellowship to work on the project at Harvard's Berkman Center for Internet and Society. The project is also backed by the National Cooperative Business Association in the US because it is a co-operative model, something akin to The Dominion/Media Co-op. The Banyan Project seeks to be the first community-level journalism co-operative in the United States. The first place they will try out this model is Haverhill, Massachusetts, a city of 61,000 that last had its own daily newspaper 14 years ago. The aim is for this model to be used in many different cities experiencing a journalism deficit, across the US and eventually elsewhere. Stites explains the starting idea was a value proposition to “deliver journalism that people experienced as relevant to their lives, respectful of them as people and worthy of their trust.” The co-operative model was deemed to be the best way to deliver this service even prior to the recent collapsing of traditional journalism business models which didn’t necessarily deliver on those three vital aspects. The Banyan business model will rely almost entirely on financing from inside the community, not only in the form of regular memberships, but also through community advertising, “extra” memberships specific to businesses or institutions, crowd-sourcing, foundation funding and ancillary sales. Content will be free to view online, but a provisional membership will be required to engage in the interactive portions of the site. There will also be the Banyan Publishing Corporation, a non-profit organization or maybe eventually a co-op of co-ops, to provide the sophisticated software infrastructure for both the journalism and community engagement website features and for what is needed to successfully run and administer a co-operative. Another person who’s been looking at how different types of media projects can finance themselves is David Skinner, a professor of Communication Studies at York University in Toronto. While Skinner describes the three alternative media outlets as extremely valiant and creative efforts, he also highlights the role of federal policy. Crowther agrees that government has an important role in supporting a strong and healthy media environment. She was the lead co-ordinator of and part of a diverse volunteer team that put on the Journalism Strategies conference in Montreal last spring. “The framework of the conference was based from the outset in the notion that public policy has a key role to play in journalism in Canada,” she says. She went on to say public policy not only refers to the federal government, but also municipal and provincial governments, as well as educational institutions such as universities. The conference was meant to generate ongoing networking and discussion around public policy advocacy. Crowther noted that OpenMedia.ca, which does advocacy work on net neutrality in Canada, was featured prominently at the Journalism Strategies conference as an organization to look to and work with on public policy advocacy. “Community-powered” news organization OpenFile.ca was represented on the conference panel, “Paying the Bills,” by their CEO Wilf Dinnick. “Community-powered” means that users suggest stories they would like to see covered, suggestions get voted on and leading suggestions are added to the “file.” Journalists are assigned to cover the stories that are voted the highest. Both the cost structure and revenue streams are non-traditional, stemming from the fundamental idea behind the site's concept: “If we started from scratch journalism, like we weren't shifting from a newspaper model to digital, and we were just working in digital, what would we do? And we'd say, 'Well, social media is connecting everyone, why don't we hear from people what they want to see reported, what's important to them?'" Dinnick told The Dominion. Dinnick explains that there is less overhead to OpenFile than a traditional news organization due to the user-generated portion of the process that doesn't require comprehensive news coverage, but more of a selective approach. There is also a different market to sell the content to; they work with news, media and marketing organizations that pay for some of what the OpenFile journalists produce. David Skinner noted that one “self-starting” concept that can help alternative media outlets in becoming more sustainable and successful is the model of The Media Consortium in the US, which provides its member organizations collective public policy advocacy, along with offering up economies of scale for developing and distributing content and support for technical infrastructure. This model of collaboration could also be something that would work in Canada. There is no shortage of discussion about the many available possibilities for a better future for independent media in this country. Perhaps, as Crowther notes, it is time for people who care about journalism and public policy to put these issues on the public agenda. 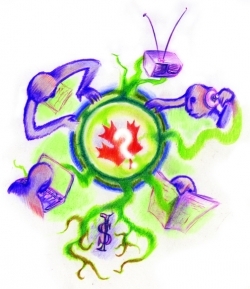 Greg Macdougall is a media activist, organizer and learning coach based in Ottawa on Algonquin Territory. More of his work is online at EquitableEducation.ca . Editor's note: Since this piece was written, OpenFile temporarily suspended publication.